THE AUTHOR: Nigerian novelist Chimamanda Ngozi Adichie. She's written three novels and a short story collection, and Americanah - her third fiction novel - won the National Book Critics Circle Award. THE BRIEF: Adichie grew up in Nigeria and moved to the United States at 19 years old to continue her college education - a personal experience that inspires this fiction novel. As an African immigrant, lead character Ifemelu (whose background is analogous to Adichie’s) struggles to find her place in a new country and experiences significant culture shock. Ifemelu copes with her new life by writing a blog. There, she can speak candidly about being a non-American black woman in America and the issues of race, gender, and ultimately identity, that come with it. The New York Times: “Many of Adichie’s best observations regard nuances of language. When people are reluctant to say “racist,” they say “racially charged.” The phrase “beautiful woman,” when enunciated in certain tones by certain haughty white women, undoubtedly means “ordinary-looking black woman.” Adichie’s characters aren’t, in fact, black. They’re “sable” or “gingerbread” or “caramel.” Sometimes their skin is so dark it has “an undertone of blueberries"... ‘Americanah’ is witheringly trenchant and hugely empathetic, both worldly and geographically precise, a novel that holds the discomfiting realities of our times fearlessly before us. It never feels false." NPR: “Chimamanda Ngozi Adichie's fourth book, Americanah, is so smart about so many subjects that to call it a novel about being black in the 21st century doesn't even begin to convey its luxurious heft and scope. 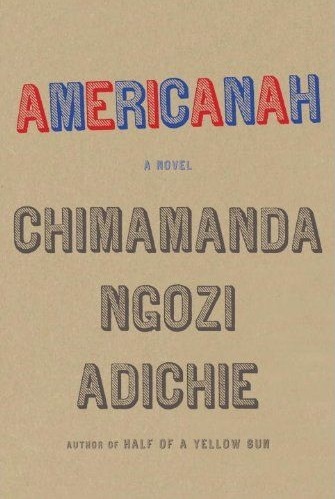 Americanah is indeed a novel about being black in the 21st century — in America, Great Britain and Africa, while answering a want ad, choosing a lover, hailing a cab, eating collard greens, watching Barack Obama on television — but you could also call it a novel of immigration and dislocation, just about every page tinged with faint loneliness."